Q. Should I Buy New Carpet... Or Have My Old Carpets Cleaned? A. Some Carpets are designed to last for only 3 years and some for 30 years, but sooner or later your old carpet will have outlived its usefulness and will need to be replaced. Below is a Quick Guide to help you determine if your old Carpet is still worthy of another professional cleaning or if it’s Time to Buy New Carpet. Is Your Old Carpet Matted Down? 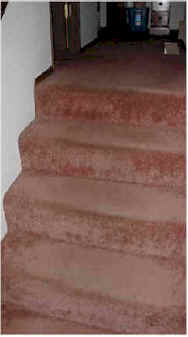 One of the first signs of a WORN-OUT carpet is when the pile starts to mat down in the main walkways and on the stairs. Your carpet doesn't have to be 20 years old to be worn-out, some carpets become worn-out and mat down in just a couple of years. If your carpet is made of P.E.T. Polyester or Polyester and is starting to mat down in the main walkways and stairs, then your carpet may be well on its way towards being worn-out. Polyester fibers are well-known for matting down and crushing of the pile because polyester is not very resilient. Once the tuft falls over and begins to mat down it won’t ever return to its original upright position. In this situation having your carpet professionally cleaned will not likely give your carpet any renewed life. What FIBER is your old carpet made of? If your old carpet is made from Nylon or Sorona® then you may be able to remedy the matting problem with a professional cleaning. Nylon is well known as the most resilient fiber because it has the unique ability to regain its like-new appearance after being professionally cleaned. Sorona®, is also known as Smartstrand®, P.T.T. or Triexta, is more resilient than polyester or P.E.T. polyester and may bounce-back and regain some of its like-new appearance after a thorough professional steam cleaning. Do You Have a Looped Berber Carpet? If you have a looped Berber carpet made from Olefin and the once upright loops are now laying down flat as a pancake then it’s likely that your old carpet has seen better days. While Olefin is a very durable fiber, it is not very resilient and therefore prone to matting and crushing of the pile. Olefin is cheap to manufacture and is inherently oily by nature; it tends to attract dirt and is hard to keep clean. Many homeowners report that oily spots or stains reappear soon after being cleaned. If your Berber carpet is made from Olefin and is more than three years old, is matted down and looking dingy; spending money on professional cleaning may not yield beneficial results. It may be time to consider replacing your carpet. Berber styles made from Nylon are much more desirable because they resist matting, are stain resistant and have a much longer lifespan. The only downside is the cost because Nylon is much more expensive to manufacture than Olefin. Expect to pay $20 to $40 per yard for a good quality nylon Berber carpet. If your Berber carpet is less than 10 years old and is made from Nylon, a professional cleaning can easily rejuvenate your carpet and provide you with many more years of service. Is your Carpet Permanently Stained? No carpet is stain proof and even the most expensive carpets can be ruined by stains. All carpets sold today have some form of anti-stain treatment either applied or infused. All topically applied anti-stain treatments can wash off or wear off over time. Scotchgard® is a well known anti-stain treatment product that is topically applied and can be reapplied as necessary. Most carpet cleaning companies provide this service for a nominal fee. Stainmaster® carpets have an anti-stain system that is infused into the fiber and does not wash or wear off. Professional carpet cleaners can remove most household stains but in some cases there is little hope. Carpet manufacturers have a list of certain types of stains that are not covered under their warranty including mustard, teas, bleaches, acne medications, plant fertilizers, drain cleaners, and plant food - to name a few. If your carpet has permanent stains or damage caused from vomit, urine, feces, mold, mildew or other biological substances then your carpet may be a health hazard and should be replaced. Consult with a professional carpet cleaner if you need an expert opinion or advice. Is your Carpet more than 10 years old? Most carpet and padding sold today is designed to last about 10 years. This is considered to be a medium grade or quality level that most homeowners select. Prices range from $20 to $35 per square yard installed with a 6 to 8-pound density Rebond padding. If your existing carpet is more than 10 years old and you have issues like ripples or wrinkles, color loss or fading, matting or crushing of the pile or a lack of padding support in halls, main walkways and on stairs then your carpet and padding is at the end of its intended lifespan. Lower quality carpet may reveal these end-of-life warning signs much sooner and spending hundreds to have your carpet professionally cleaned won’t make a worn-out carpet come back to life. Is Your Padding Worn Out? When you buy carpet it is very important that you buy the correct padding to go under it. Padding is considered the heartbeat of your carpet and once it fails to provide enough support your carpet will start to wear out much faster. So when you are ready to buy new carpet, be sure to choose a good quality padding that is able to provide sufficient support and has a lifespan equal to the grade of carpet you select. If you find that your existing padding is worn out and your old carpet still looks like new, you might be able to just replace the padding to give your old carpet several more years of added life. This is not a common thing to do and you should ask your professional carpet cleaner if this might be a viable option for you. Why hire a Certified Carpet Cleaner? Not all carpet cleaning companies are created equal. Some are definitely more reputable than others and homeowners need to be careful who they hire. Costs can vary greatly and hiring the company with the lowest price may not be the smartest way to go. Watch out for companies that have low-cost specials that sound too good to be true. You don't want to hire an inexperienced carpet cleaner that will soak your carpets and do a lousy job. Hiring a Certified Carpet Cleaning Company will ensure you get the job done right and get a fair and square deal. There are several well known non-profit organizations that establish and maintain industry standards. Reputable carpet dealers receive ongoing education and training, earn certification and agree to follow honest business practices; use top quality cleaning products and equipment and follow a published code of ethics. You never want to hire a fly-by-night carpet cleaner! The two organizations I trust are; The Institute of Inspection, Cleaning and Restoration Certification (IICRC), and The Carpet and Rug Institute (CRI). These are their seals of approval you should look for when looking for a reputable carpet cleaning company. There are several types of carpet cleaning systems available and choosing the right process for your type of carpet is very important. Most carpet cleaning companies use a truck mounted machine that uses a steam cleaning process also known as "hot water extraction". For Berbers made of Olefin, you never want to get the carpet too wet so using a low-moisture cleaning process would be a smart way to go. Wool carpets should only be cleaned by a reputable company that specializes in cleaning wool carpets. Contact your professional carpet cleaner for more information and carpet cleaning advice. Are You Getting Ready to Buy New Carpet? When it’s finally time for you to start looking for the perfect carpet, there are many important factors that you must consider to determine what grade of carpet can meet your needs, goals, lifestyle and budget. You must know how to consider fiber type, face-weight, pile density and tuft twist to name a few. Choosing the wrong carpet or padding can be a very costly mistake. The price of new carpet has increased dramatically over the past decade and there are plenty of common carpet scams and consumer pitfalls you need to learn how to avoid. How Often Should I Have My Carpet Cleaned? How Much Does New Carpet Cost? How Do I Choose New Carpet Wisely? Best Carpet Vacuums - How Often Should I Vacuum? It's hard to find a reputable Carpet Dealer these days! That's why I have built my own special list of hand-picked carpet stores who are locally-owned, give free estimates, offer fair prices, have knowledgeable staff, provide honest measuring and hire qualified installers.